Blackburn Barn Topics: Stalls - Blackburn Architects, P.C. : Blackburn Architects, P.C. a. Adding to the overall length and/or width of a barn. b. Requiring roof framing to be increased from 2×10’s to 2×12’s or even greater. c.	Increasing the span of the framing lumber. 2. Partitions between stalls should be at least 8 feet high, but they don’t have to be solid from top to bottom. Barred or mesh portions on the top enhance ventilation. This also has the benefit of allowing horses to see their companions — and provides easy observation of the horses by their owners. 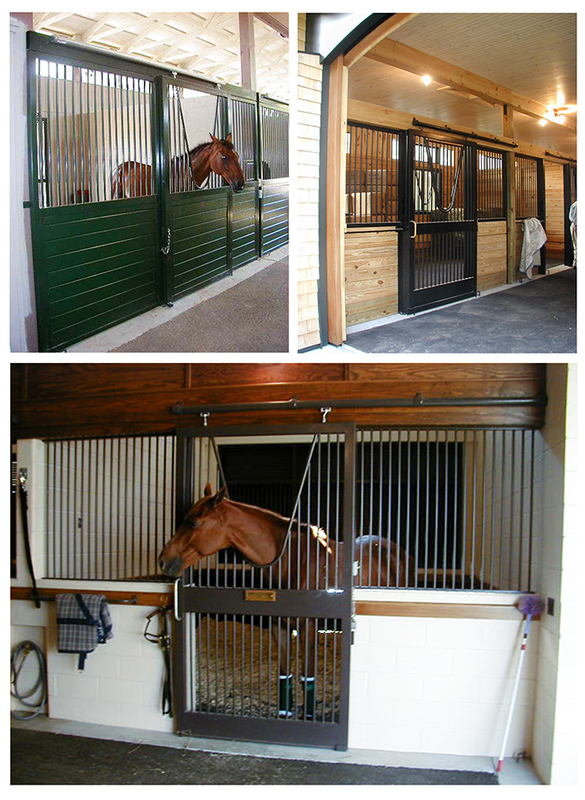 The down side is the increased ventilation between stalls can increase the risk of bacterial infection between horses. For the same reason, doors that are open on top increase light and ventilation. Bars must not be more than 2 to 3 inches apart, and openings should not be more than 2 inches across to prevent hoof entrapment. 3. Steel mesh or bar fronts on stalls allow an owner to look down the aisle or into the stall as they walk down the aisle and see their horses. The mesh is good for ventilation, too. The drawback is that bedding can be kicked into the aisles, so we recommend adding bedding guards. Welded steel mesh is typically stronger than bars but the horizontals tend to collect dust and can add to barn maintenance. a. Prevention of an unlatched door swinging open accidentally, or the wind catching it. 5. We recommend rounded edges in stalls and anywhere in the barn where horses have access. A casting rail (which can be a groove in the wall or a 2-by-4-inch rail bolted low to the wall), provides something for the horse to catch his foot on when rolling to avoid getting cast. 6. Provide for easy access to the stall for feed buckets without opening and closing the door. Place in one of the front corners adjacent to the aisle. 7. Automatic waterers have the advantage of offering constant fresh water, but be sure to buy a model that is easy to keep clean. If you don’t want automatic waterers, install water hydrants between every couple of stalls and provide for ample drainage for drips and overflows. Don’t forget to frost-proof them in climates where pipes are apt to freeze.